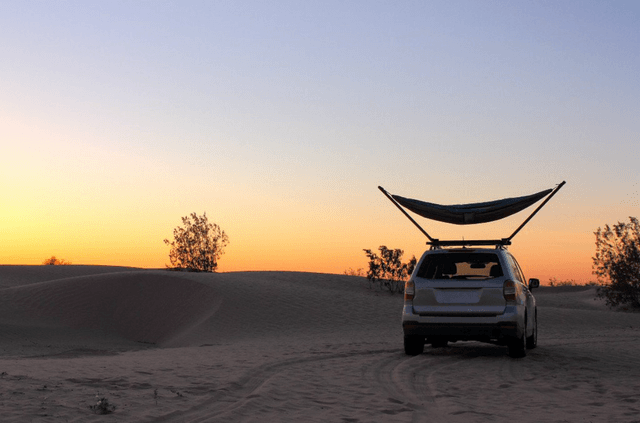 Rooftop tents are popping up everywhere but tents aren’t the only way to sleep atop your vehicle. A rooftop hammock lets you sleep under the stars but off of the ground’s hard surface and away from creepy, crawly, slithering creatures. 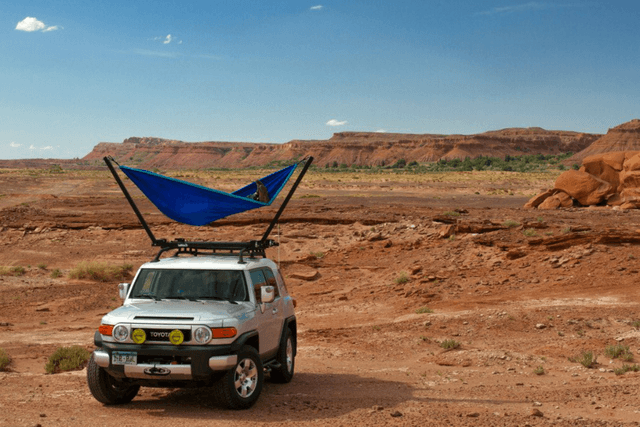 TrailNest‘s rooftop hammock stands are a convenient and inexpensive alternative to sleeping in a tent-in-a-box-on-a-truck. One quick caveat, however: It’s BYOH as in, you have to bring your own hammock due to TrailNest only selling stands and stand accessories. So, if you already have a standard-size hammock, you’re good to go. Thankfully, for those without one, there exist loads of hammock styles, colors, and patterns available elsewhere and don’t tend to be terribly expensive for a basic model. Furthermore, we recommend using an open weave hammock during the summer and thicker fabric in cooler months. While traveling and looking to find the right place to settle for the night — or just to take an afternoon nap — it’s easy to set up the TrailNest hammock stand. Despite its design as a rooftop hammock, it also allows you to remove the stand from the roof and use it on the ground. Each hammock stand is rated to hold 250 pounds. 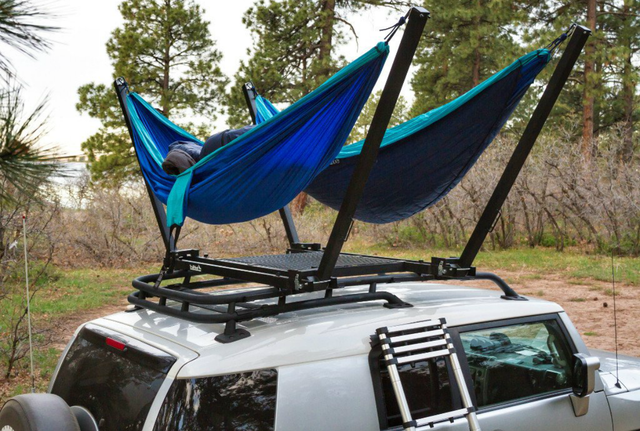 TrailNest’s rooftop hammock stand attaches to standard SUV roof bars and when folded for travel, stands 60 inches long and 4 inches high. Unfolded, the stand arms are 45 inches high and span 111 inches. When traveling with a companion, it allows you to use two hammock stands on a rooftop for added flexibility. TrailNest also sells floor panels that attach to the stands which give you a place to stand rather than directly on your vehicle roof. You can buy hammock stands and floor panels separately or in single and double systems that include stands and floors. If you had a double stand and floor panel system you could put a cooler between the hammocks for snacks and drinks. Imagine the possibilities. An optional collapsible aluminum ladder is a convenient way to get to your vehicle roof. The ladder extends to 10.5 feet, so it could be handy at home, too. TrailNest promises to offer optional single and double stand system rain flies for protection from wet weather, but they are not yet available.